An appeal that raised some $2 billion to help millions of people in Yemen was a “remarkable success of international solidarity” for the country’s war-weary people, but aid alone will not provide a solution to the conflict, United Nations Secretary-General Antonio Guterres said on Tuesday. Speaking to reporters in Geneva after opening a pledging conference for Yemen, Mr. Guterres said that more than $2 billion had been promised by Member States before the end of the event. The event was co-chaired by the UN and the governments of Sweden and Switzerland. 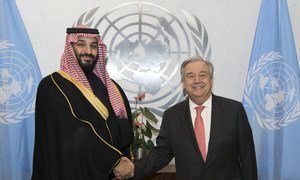 Pledges were made by 40 Member States and organizations, including the Central Emergency Response Fund (CERF), for humanitarian action in Yemen in 2018.
International pledges for nearly $2 billion represent almost double the amount raised in 2017 to fund humanitarian aid in the Arabian Peninsula country. Yemen has been at war for more than three years. Conflict is ongoing there between an international coalition forces supporting President Abdrabbuh Mansur Hadi on the one side, and Houthi militias and allied units of the armed forces on the other, which seized control of the capital, Sana’a. Aid agencies have repeatedly warned about the toll this has had on non-combatants: forced and repeated displacement of families, massive food insecurity and the collapse of essential services including healthcare and education. In 2017, the world's worst outbreak of cholera to date affected one million Yemenis, and diphtheria is now on the rise in what was already one of the poorest and most vulnerable countries in the region before fighting erupted. UN Emergency Relief Coordinator Mark Lowcock at the High Level Pledging Event for the Humanitarian Crisis in Yemen. Mr. Lowcock, who is the UN Emergency Relief Coordinator, stressed the dire situation faced by millions of families in Yemen. The $3 billion appeal target represented a “substantial sum of money,” he said, but it was “small in relation to the needs” of Yemenis. Many now face a 25 per cent rise in the cost of food, the UN official said, explaining that the country imported nearly all of its daily requirements and had been hit hard by the sharp devaluation of the country’s currency, the Yemeni Rial. In total, some 190 organizations – 150 of which are Yemeni – are involved in the UN-coordinated humanitarian response plan. It has been responsible for scaling up food assistance to seven million people a month, and helped boost access to water, health services and sanitation. Such support would not be possible without sufficient funding, Mr. Lowcock said, before listing other “key conditions” that needed to be met to enable an effective humanitarian response. First among these is aid access. The end of last year saw severe delays in unloading basic foodstuffs caused by the enforced closure of much of the country’s air, sea and land ports by coalition forces. Mr. Lowcock also called for public sector salaries to be paid across Yemen after months of non-payment; this would prevent another cholera outbreak by providing essential services, he said, and keep children in school, providing essential continuity for them. Those comments were echoed by Isabella Lovin, Deputy Prime Minister of Sweden, who told journalists during a break in the pledging conference that every day the conflict drags on “is one day too many” for ordinary Yemenis. In response to a question about the progress of UN-led efforts for peace, Mr. Guterres told reporters that his Special Envoy for Yemen Martin Griffiths had been “very encouraged” by his recent discussions with representatives of the warring parties in Sana’a and Riyadh. The Special Envoy would also be going to the United Arab Emirates, Oman and Aden for talks, Mr. Guterres added.